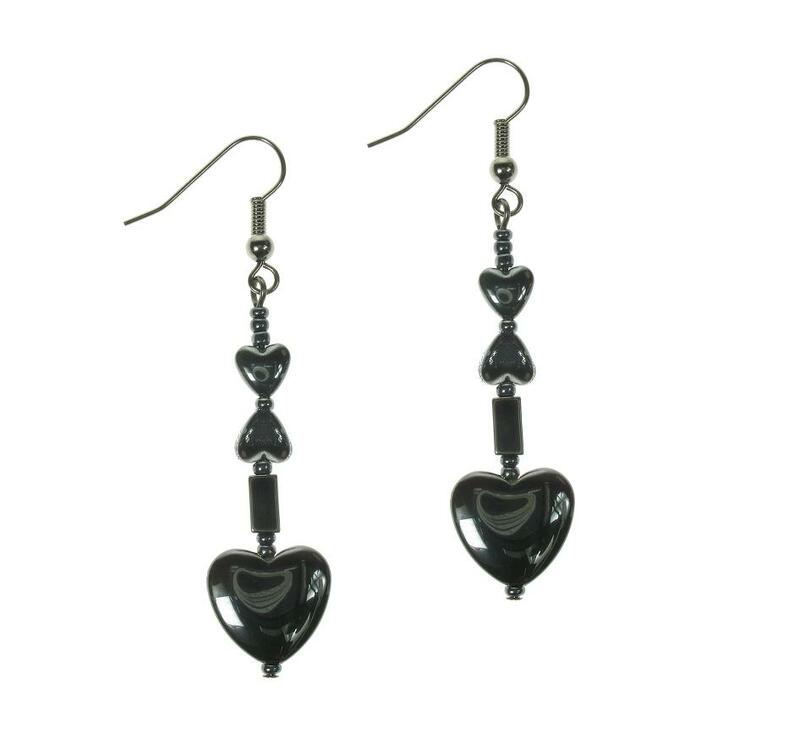 Hematite heart earrings. The largest heart measures 1.3cm/13mm. 2mm seed and 6mm oblong Hematite beads. Total length 6.2cm/62mm. Hooks for pierced ears. Hematite/black plate. Beautiful drop bead earrings. Black, light pink and turquoise hand-worked Moretti glass beads. Beads measure approx. 1.2cm/12mm wide. Total length 6cm/60mm. Swarovski crystals in pink alabaster (4mm). We have a variety of hooks should you prefer a shorter style. Beautiful drop bead earrings. Clear khaki and turquoise Moretti glass beads. 'Mis-match' spots and stripes. Beads measure approx. 1.2cm/12mm wide. Total length 6cm/60mm. Swarovski crystals in turquoise (4mm). OOAK. Alternative earring fittings are available upon request. Beautiful drop bead earrings. Black beads with blue polka dots and raised clear 'lumps' which appear blue/black due to the base colour, very effective technique. Moretti glass beads. Beads measure approx. 1.2cm/12mm wide. Total length 6cm/60mm. Swarovski crystals in blue. OOAK. Alternative earrings fittings available, please email us for details. Beautiful quality glass flower drop earrings, the largest bead, the glass flower is 1.1 cm/11 mm. They are 5 cm/50 mm in total length. The posts are hallmarked 925 sterling silver. Hook for pierced ears - comes with rubber bungs which should be worn to prevent loss. Frilly-PINK tag. 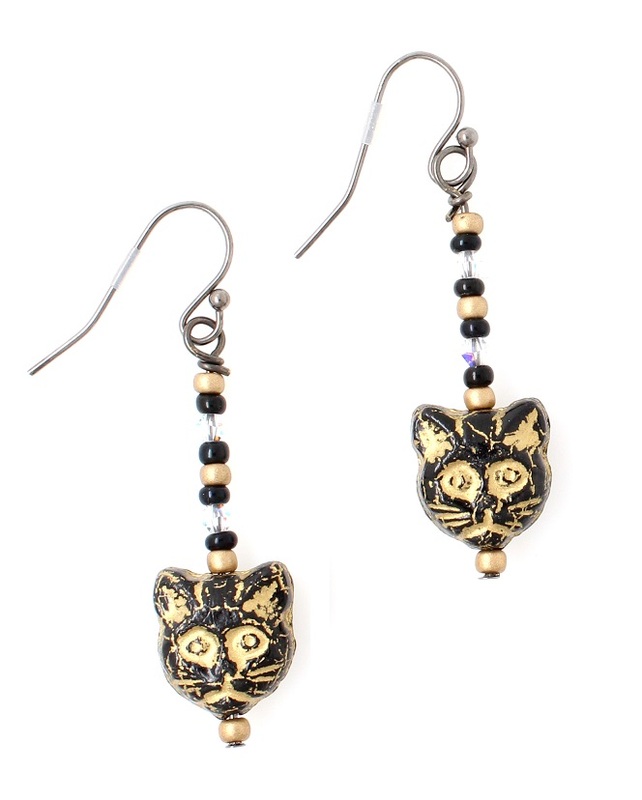 Beautiful cat themed drop earrings, with glass and quartz in black and gold tones. The glass cat heads are made by hand in pressed glass and then the detail is highlighted with gold leaf which is fixed and won't rub-off. The various beads used vary in size the largest being the glass cats at approx. 1.5 cm/15 mm. They are 4.5 cm/40 mm in total length. Hook for pierced ears - comes with rubber bungs which should be worn to prevent loss. Frilly-PINK tag.